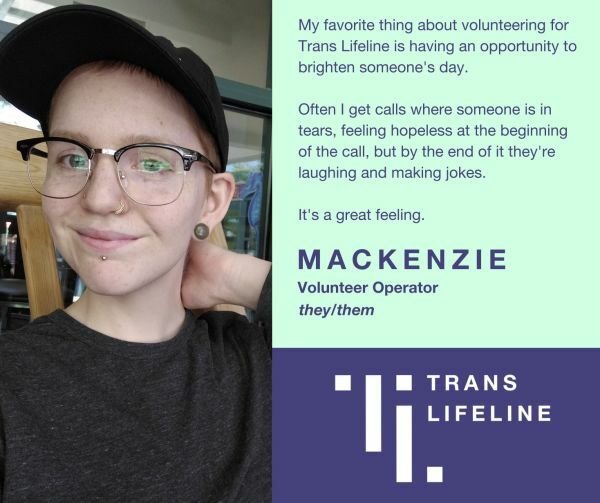 Since we launched in late 2014, Trans Lifeline’s Hotline has fielded calls from all 13 provinces and territories in Canada, all 50 states in the United States, and 61 other countries alloverthe world. in that time, we’ve added staff, increased our capacity to serve our community, and worked with Contact USA to ensure that we’re meeting the highest standards for a peer support line--and they’ve accredited us! We’ve grown a lot over the years, but one thing hasn’t changed: we believe in offering the most authentic and respectful peer support possible. That’s why we’re proud to announce that Trans Lifeline’s Hotline has answered 50,000 calls! First, we could not have done this without the hard work of our incredible operators, ninety percent of whom are volunteers and all of whom are trans. Every week, our teams give their time, energy, and love back to the community by answering calls. We’ve trained more than 800 volunteer operators in the last four years, and we know without a doubt that they’re rock stars. We are extraordinarily proud of them and grateful for their dedication. To those in the community who have supported our work in other ways, thank you. We take the responsibility of caring for our community very seriously, and we appreciate the trust and support our community has given usoverthe years. We want to give special thanks to everyone who has donated to help keep our work going - especially the daily small donations we receive from individuals in our community. Your support means the world to us. What have we learned in 50,000 calls? We’ve learned, more than anything, how resilient our community is. Our callers and operators face immense pressure every day - at work, at home, in schools and on the streets - but in spite of them all, we survive. We’ve learned that the reason we survive, the reason we’ve always survived, is the support and care we give one another. We’ve learned that the smallest amount of shared experience can help a person get through a day, and that the experience of being able to be there for someone is one of the most empowering there is. We’ve learned that, for a person in crisis, authenticity and empathy from a peer who relates can go farther than any other intervention. To be an operator with our hotline, the most important quality a person can have is respect for their peers. While it may be small, we know that our trans community is a diverse one. Our operators never answer a call from a position of authority - we believe that we are having a conversation with a peer, that we can be a friendly ear that may also have some insights and resources to share. An operator doesn’t have to be an expert on anyone else’s experience. All they need to be is a fellow trans person willing to listen. We know that being trans is but one aspect of who our callers are. We strive to have our operators match the diversity of our callers and be able to relate to not just their trans identities but to every part of their existence. 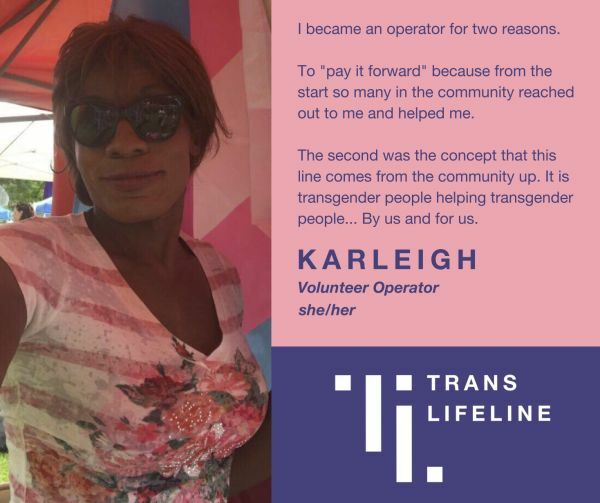 Here’s what a few of our volunteers had to say about why they decided to be operators and what they love about the work. 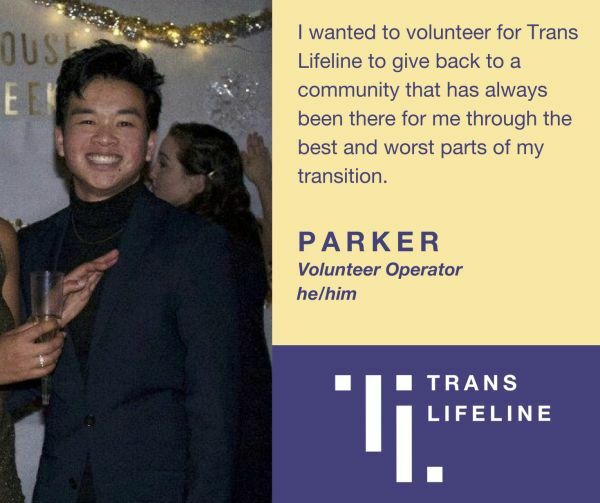 While our capacity at Trans Lifeline is growing, the need for our services is growing even faster. Caring for our community is a job for our community. Want to get involved with our Hotline but not sure how? with so many ways to support the Hotline, there’s probably one that works perfectly for you! If you are trans, over 18 and have a phone and internet, consider signing up to help out as an operator! Our hotline is open 24/7 and can accommodate any schedule. We will work with you to find the best ways that you can use your experience to help our community and make sure you’re prepared to answer calls! All of our volunteers go through a comprehensive online self-study training that covers everything you need to know as an operator - and our support for you doesn’t stop there. Experienced operators are always around to provide mentoring and support as you volunteer. We’ve got your back. You can donate! Our work is 100% privately-funded, so we are always looking for donations! If you want to make an even bigger difference, become a sustainer - recurring donations are what keep our services running and our calls answered day after day. Either way, you’ll be keeping our phone line open and staffed with great operators. and if you want some cool gear in return for your money? You can buy our merchandise in our online store! Just be sure to mention us when your friends ask you about your cool new mug! Supporters can hold fundraisers - either in-person or online - to help keep our work going and growing! If you’d like to help out by holding a fundraiser, we’d love to hear about it. For questions, email [email protected]. We are grateful to have the opportunity to collaborate with other organizations in our community. From day-to-day advocacy for our community to the educational resources we provide to other hotlines and professionals, we look forward to continuing to build trans unity and power, entrenching trans competency in all areas of work and helping build a network of resources and support for our community. And please keep in touch! Meet us in person this week - at the Philadelphia Trans Wellness Conference! We look forward to seeing you at our table or at one of our workshops! Check us out on social media - we are on Facebook, Twitter and instagram! Follow our pages and share them with your friends and contacts!